When launching a blog or even just reviewing your current one, there's one thing that reigns above all: your brand voice. The content that attracts a following is that which stands out from the competition. It has a unique, authentic tone; one that makes its audience feel like they're connecting with someone. You can produce all the quality content and place it on the coolest-looking site, but without this sense of character, it won't take you very far. So how on earth to you establish something that powerful? 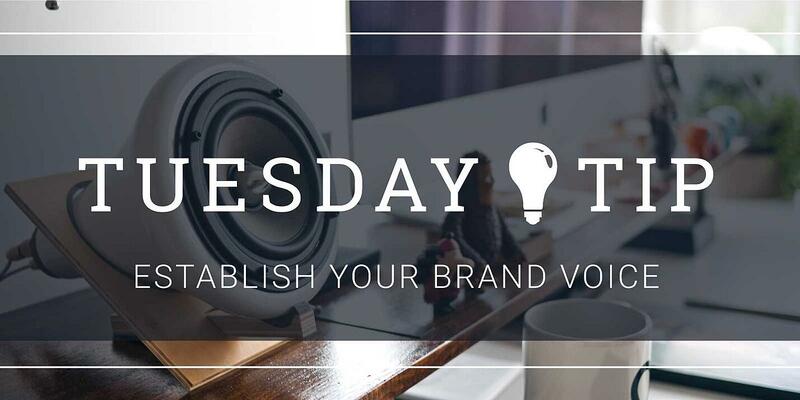 This week's Tip: Take time to build your brand voice. In establishing a brand voice, especially after launching a new site or new blog, it may seem like starting fresh is the way to go. However you've already completed ample research to get you started. Take all of your existing content—no matter the medium—and review it with a critical eye. If you spot content that could easily have been written by a competitor, set it aside. It's not representative of your unique voice. As Content Marketing Institute's Erika Heald suggests, "[y]our goal is to whittle down your examples to a small group of pieces unique to your brand – examples of the brand voice you want to embody." Now you'll have not only a foundation of strong content to post on your updated blog, but you'll also have a few examples to look to when you need clarity. We say this a lot, but audience is your greatest priority. It's not about what you think your brand voice is, but rather, it's seeking what voice will resonate with your target audience. If you haven't done so already, go through exercises with your team to create and define audience personas. If you struggle to connect that persona with what type of content they'd like to read, use Jayson DeMers' guide on Search Engine Journal. Include these materials in your style guide, which we'll discuss below. Now that you know who you're talking to in general, you can get specific on how you'll talk to them. First, let's map out your brand tone into three words. Take the content you pulled in step one plus the audience members you defined in step two and discuss the common themes. Once you have those, build yet another persona: your brand. If your brand was a person, how would you define them in three words? Authentic – genuine, trustworthy, engaging, direct"
Now that you have the core of your brand voice, define how these traits can be implemented. 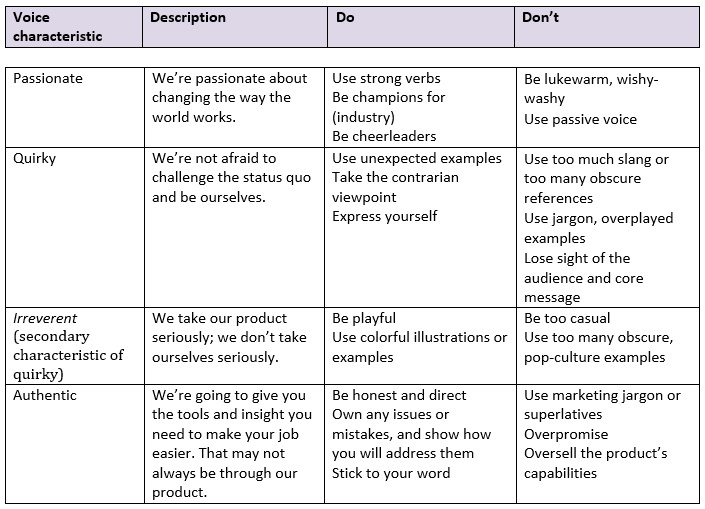 Desribe what each word implies about your content and the do's and don'ts of how you'll apply it. Now, rather than taking all these audience personas and applying each adjective to all your content, choose one person at a time. ProBlogger suggests that with each piece of content, you simply picture one audience persona and produce the content directly for them. This will help your content feel authentic. An added bonus is it can keep you inspired; if you picture the actual people you're helping with your content, it's more likely you'll feel motivated to write. Another ProBlogger tip is to keep your writing process separate from publishing. The time and space between these steps will keep each more effective. You can be more free in your writing, and then come back with a clear mind and objective perspective. Without doing so, you risk being in a certain mood while writing, conveying that tone instead of your brand's voice. In order to make this brand voice loud and clear, it needs to be applied across your entire site, your blog and your promotional materials. For your final step, you'll need to develop a style guide and ensure your team members know how to use it. Consolidate the above information—definitions, charts and decisions—into a style guide. It may take time, but it's vital you walk each writer through the pieces. If you need a unbiased perspective for setting up your brand voice, send us a note at ArcStone. We've walked hundreds of companies through exercises like tho ones above and would love to help you build your brand.